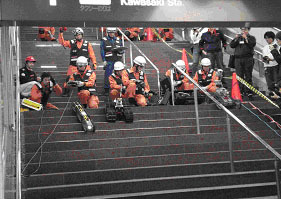 Special event "Demonstrative Experiments and Trainings for Rescue Activities using Robotic Systems" will be held at the University of Electro-Communications in Tokyo, Japan, as a part of SICE Annual Conference 2008. Every participants of SICE Annual Conference 2008 are welcome. Special event "Demonstrative Experiments and Trainings for Rescue Activities using Robotic Systems"
PDF version is available (300KB). Intelligent rescue systems with advanced information technologies and robot technologies are expected to mitigate disaster damages, especially in Japan since the 1995 Hanshin-Awaji Earthquake. In development of robots for search and rescue tasks it is important to develop systems and infrastructures which can work in real disaster sites. International Rescue System Institute (IRS) is an industry-government-academia-civilian research organization to develop and diffuse advanced technologies to cope with disasters. IRS aims to contribute to build a safer society, in which people can live with less anxiety, through cooperation of various organizations and human resources. 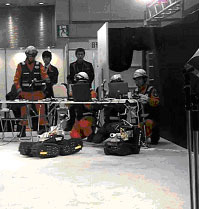 In this special event, we demonstrate experiments and trainings for the searching task in rescue activities with rescue robot systems by collaboration with IRS and UEC.